Jenni Ferrans and Vanessa McPake look for the picnic table. 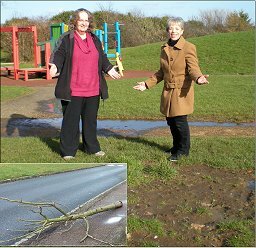 Inset: the damaged tree dumped in Crowborough Lane. Over the past two months a gang of young people seem to have been having a mindless field day in Kents Hill Park and the young children’s play area. Some trees, the stakes supporting the trees and the main picnic table and bench have been removed from in and around the play area. Worse, all were then dumped in the middle of Crowborough Lane! Many thanks to the residents who informed the police and moved stuff out of the road! The Focus team are trying to get the picnic bench and trees replaced and they have asked the Police to patrol or install a camera for a while to see if they can catch the offenders. 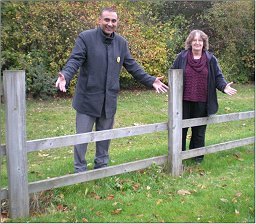 Subhan Shafiq and Jenni Ferrans say “Fix our Fence” on the side of a major bridleway off Kilwinning Drive, Monkston. The fence was damaged weeks ago! And don’t leave your SatNavs in your car!